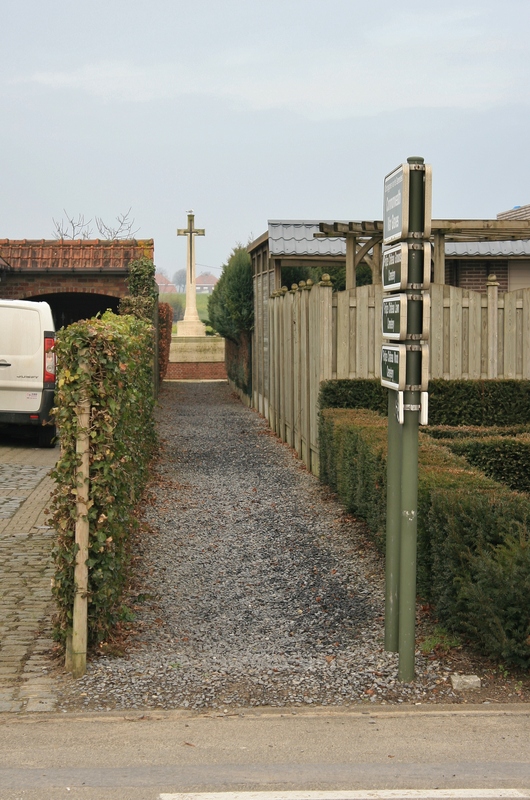 Skirting the field to the north of Grounds & Lawn Cemeteries, this grass pathway leads us to the fourth cemetery that bears the name Potijze; Potijze Chateau Wood Cemetery. 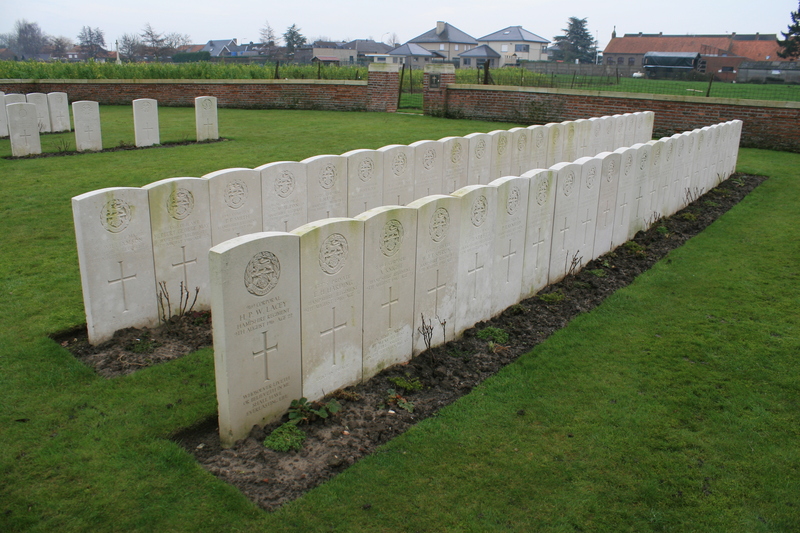 Above & below: 42 men of the 2nd Battalion, Hampshire Regiment, more victims of the German gas attack in the early hours of 9th August that caused the battalion such devastating losses (see Potijze Burial Ground for more details); You will notice that one grave in Row 1 A (the second row) is unidentified, and another is that of a man of the Dorsetshire Regiment, killed in the same attack. 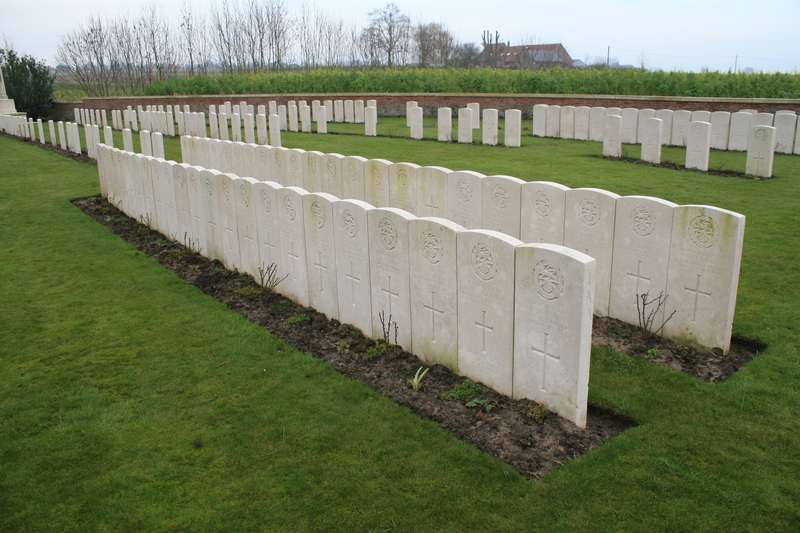 In total, 47 Hampshires who died in the gas attack are buried here. 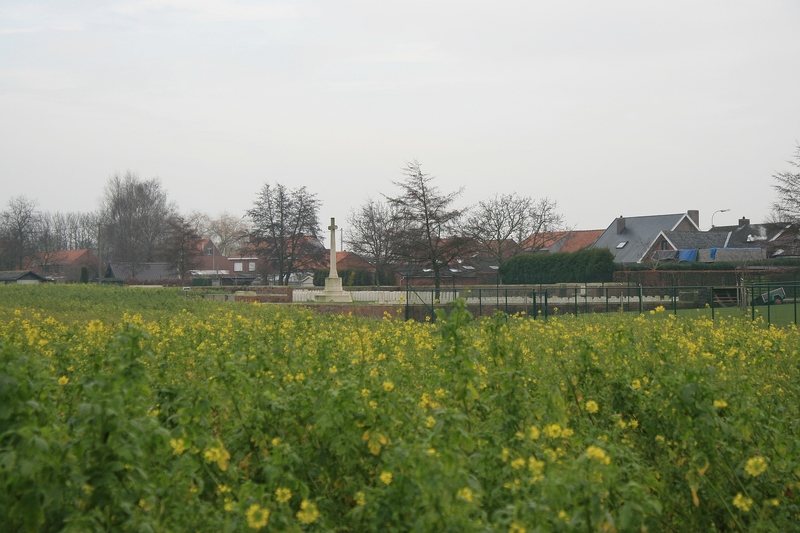 Ironically, a gas attack and accompanying artillery barrage, such as happened that night, would usually presage a full-scale attack, but on this occasion, and despite the disaster unfolding around them, British Lewis guns, traversing the enemy parapet, prevented the Germans from leaving their front line. It was not just the Hampshire Regiment who suffered that August night. 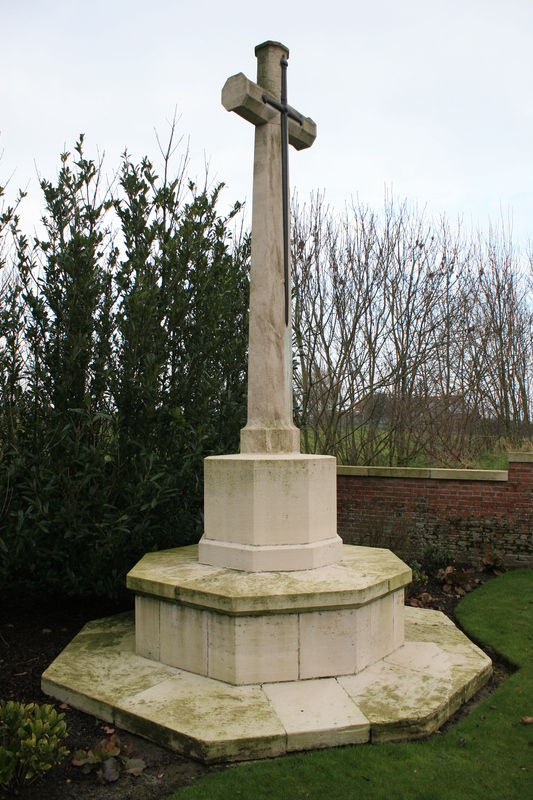 The men of the 1st Battalion, Royal Inniskilling Fusiliers were also holding the front line, and 79 of them fell victim to the gas. 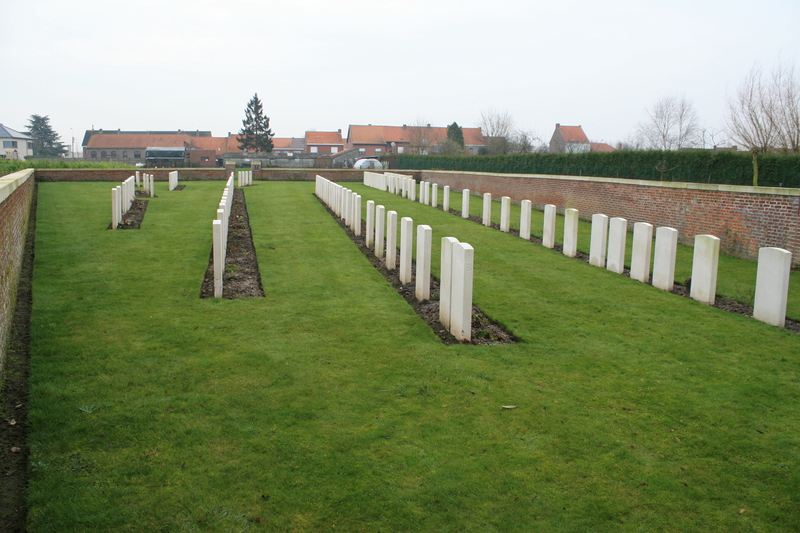 Twenty are buried here in Potijze Chateau Wood Cemetery, the majority in Row F (above). It may be no coincidence that in August 1916 the British were in the process of introducing a new gas mask, the small box respirator, intended to replace the PH helmet that had been in use since the beginning of the year. Perhaps these men were still using the old gas masks, or perhaps they were unfamiliar with the workings of the new ones. Maybe the masks themselves were faulty, or maybe they were, as we are led to believe, simply caught unawares, and paid a terrible price. The majority of the burials in Row D behind are of men of the Rifle Brigade, killed on 30th June 1916. 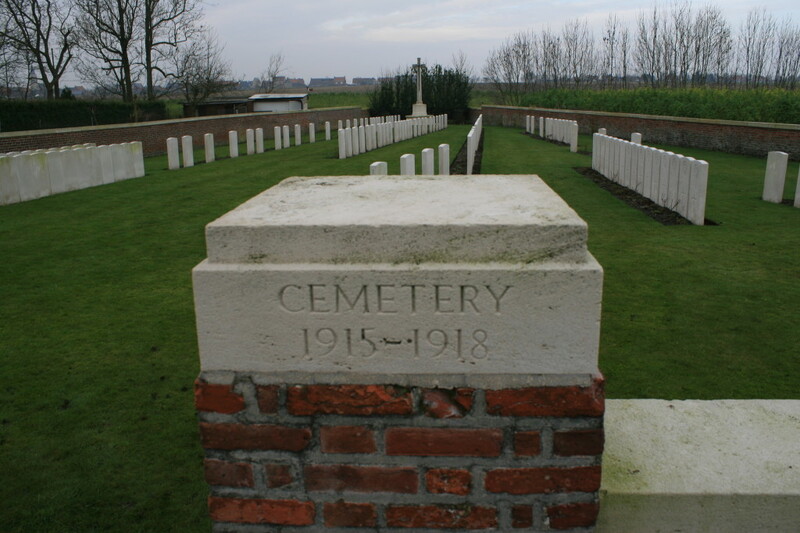 Near the northern end of the cemetery, Row C in the foreground, Rows B & A beyond. 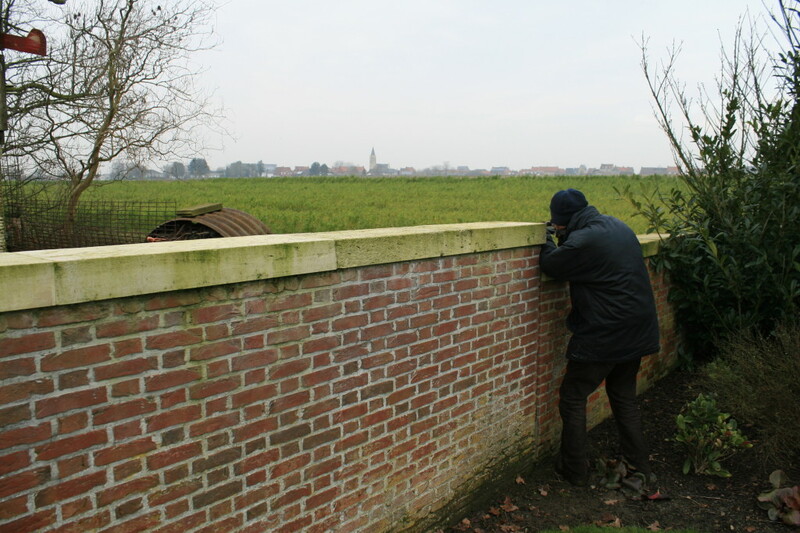 Looking over the cemetery wall across the fields to the north west towards St. Jin (St. Jean during the war), the church of which you can see on the horizon. 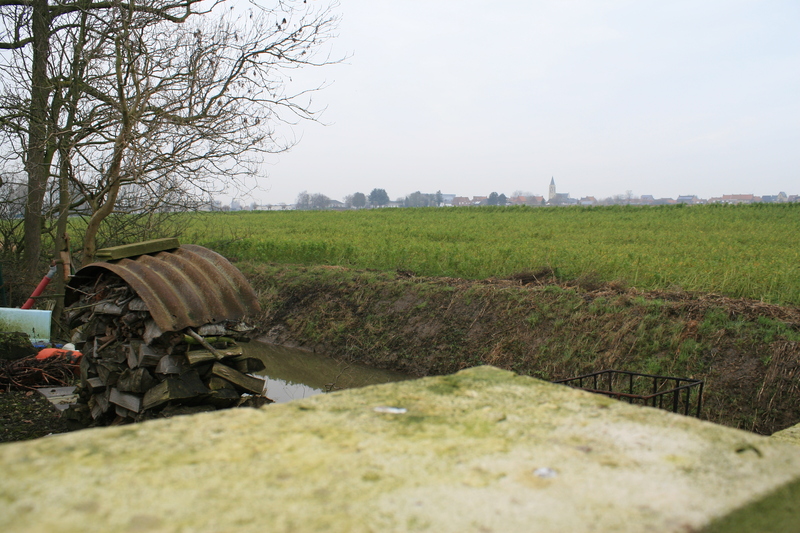 Note the piece of corrugated elephant iron, used in the construction of dug-outs during the war, and still in use nearly a hundred years later, and the Bellewaerde stream running beneath the cemetery’s northern boundary wall. During the war the British would check its depth daily, just in case the Germans were attempting to somehow flood the British positions. 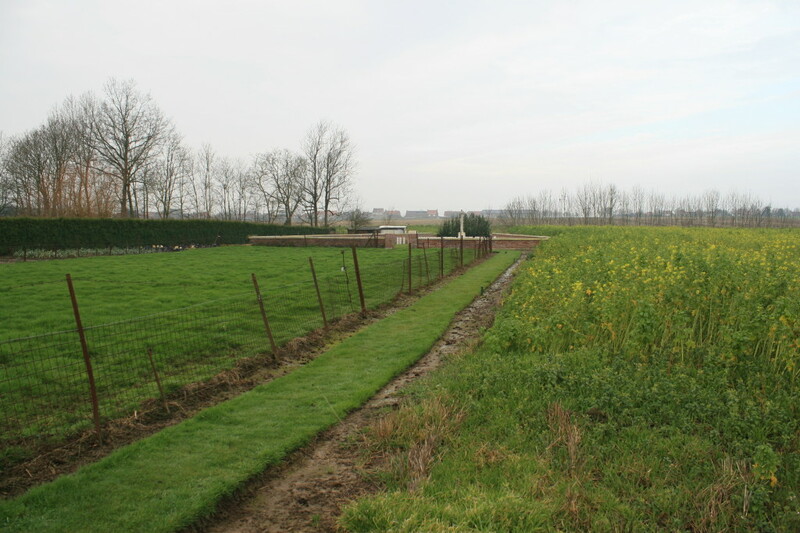 The British front line, away to the east, was not a trench in the traditional sense; as we have just seen in the previous photograph, the high water table prevented the digging of deep Somme-like trenches, so a breastwork front line was constructed using piled sandbags (the Germans, as usual on higher ground, were less hindered). 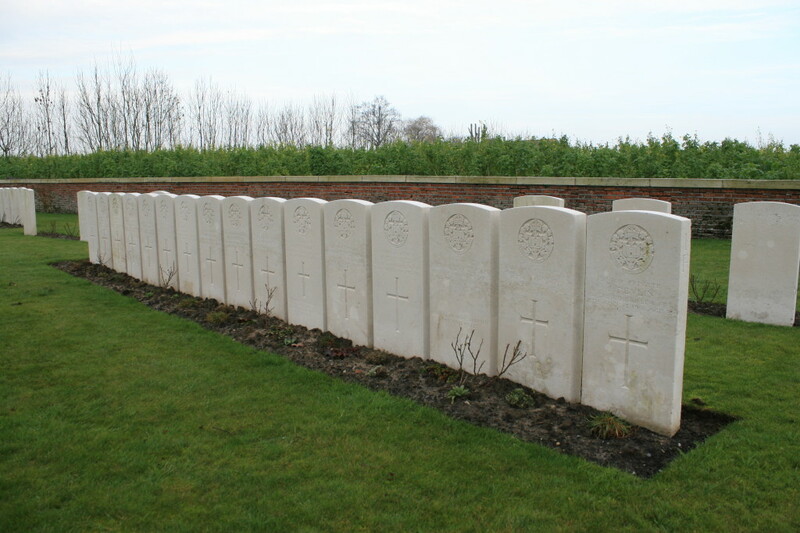 Edmund Blunden describes it thus in Undertones of War, “The front line was crude and inhuman. The parapet was low, and such a man had to stoop all the way along. On our right…a great mine-crater interrupted our prettily alternating bays and traverses. There were no dugouts in the front line, and even recesses for bombs and ammunition were scarce. Still further ahead was the British wire, a thin brambly pretence, nor was the German wire at this point the usual series of iron thickets. Their front trench was much higher than our own, and behind it the ground made a gradual ascent. Deathly blue, sable, hung the pall of the great cold over this battlefield”. 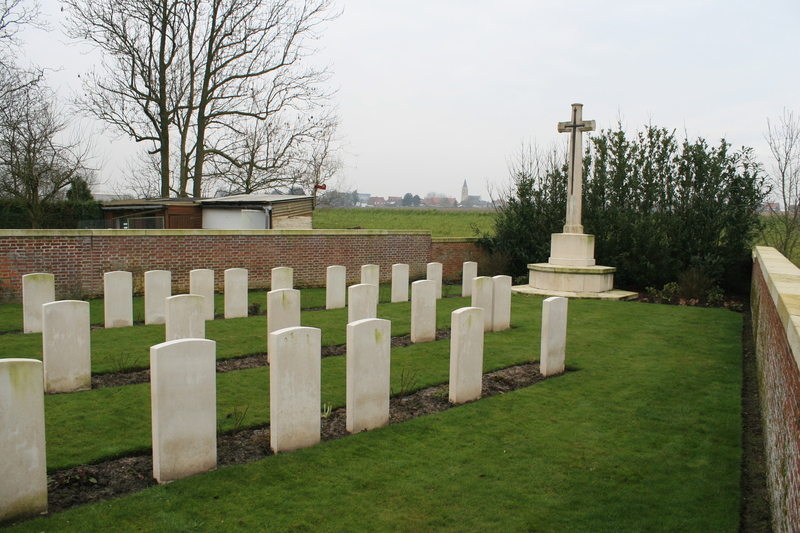 Looking roughly south east down the length of the cemetery, back towards the cemetery entrance. Time to leave. Mainly because its too damned cold to hang around any longer. 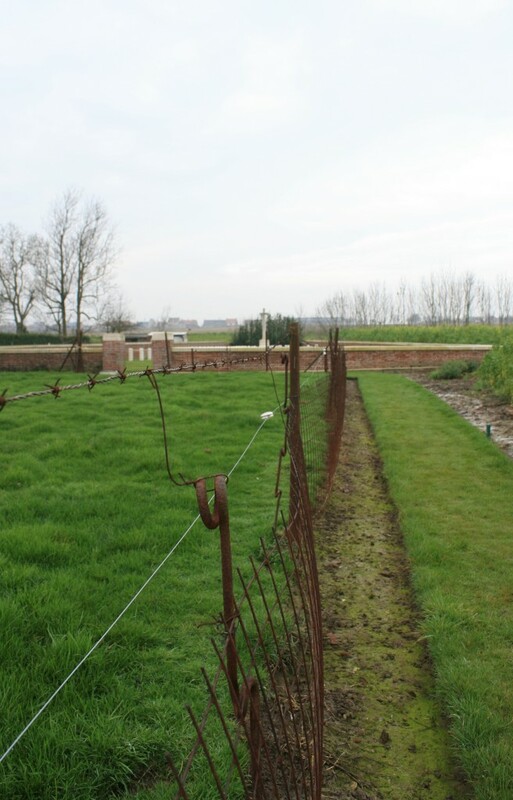 More First World War relics, this time two of the steel rods introduced by the British to replace the old system 0f mallet and stake, and the associated noise problems, that had previously been used. Insert a smaller steel rod horizontally into one of the hoops and then keep twisting clockwise, and the corkscrew end would bury itself in the ground. Barbed wire could then be strung between the hoops of each rod, creating a barbed wire barrier. These ones are still being used for much the same purpose. …before heading back to the car and some much needed warmth. And you’d think that’d be that. Home for a nice cup of tea. But no! 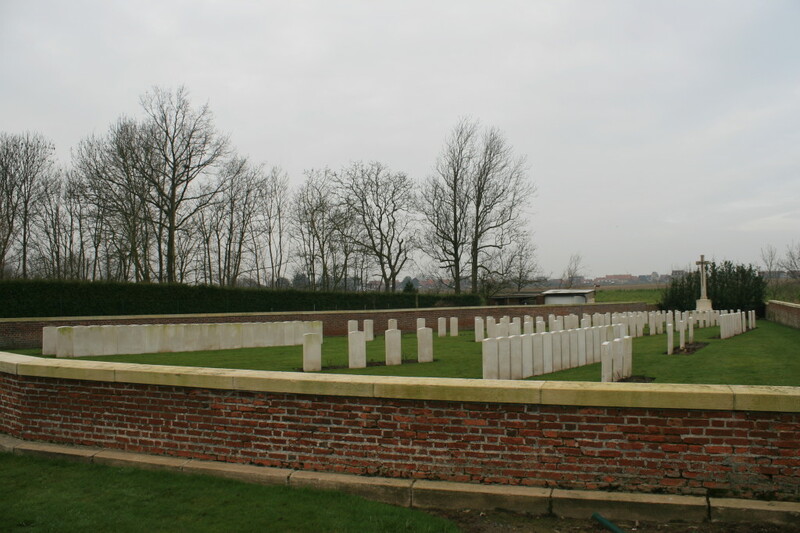 Baldrick and I are made of stern stuff, and there are two more cemeteries, one French and one British, not so far up the road. Onwards! 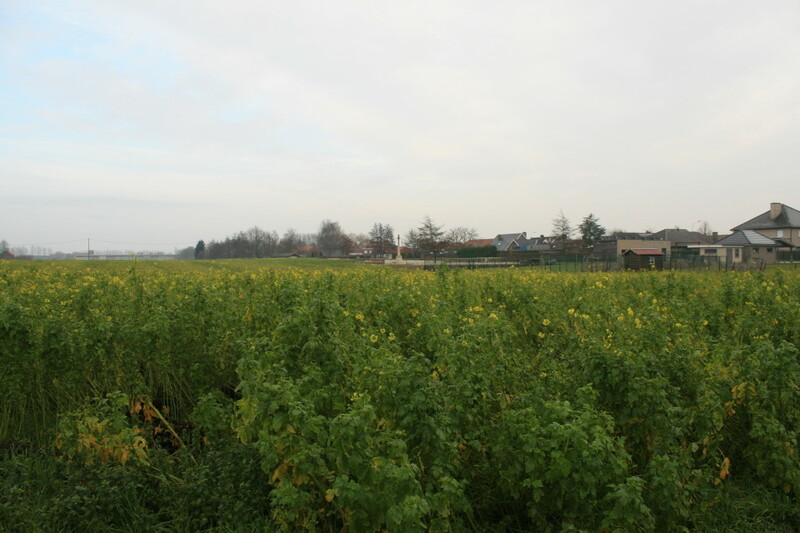 This entry was posted in Potijze. Bookmark the permalink. Wish I had known of this info. before. 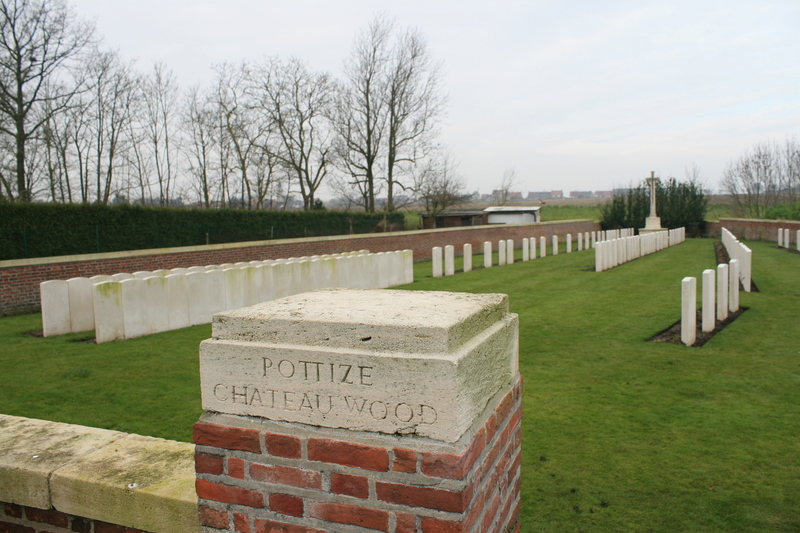 Yesterday, returned from a Remembrance tour of various battle sites & grave sites, in particular Potijze Chateau Wood Cem. That’s bad luck! Sod’s Law, I believe. But at least you can relate what I have written to your visit yesterday. I mean, you’ve actually had the chance to go there. I hope it was a bit warmer than it was when I visited! A friend and I are going to retrace the route taken by Gunner L.Crotty of the 87th Howitzer Battery. 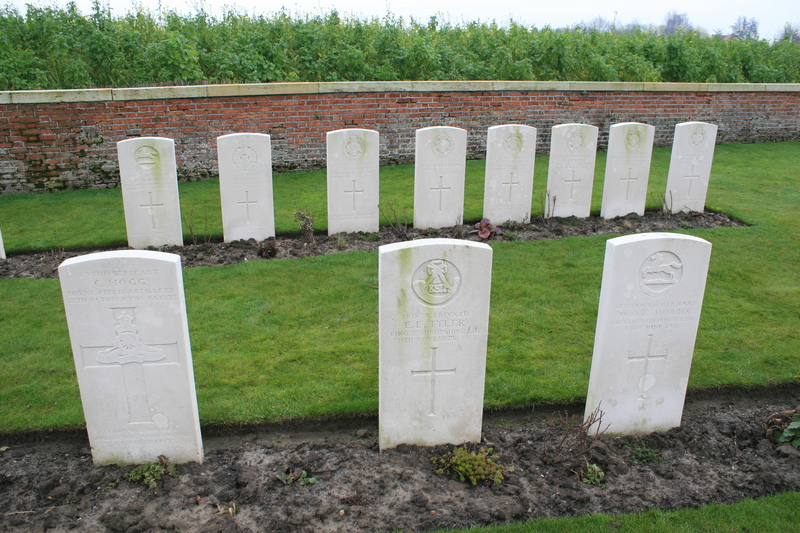 Laurence was killed at Ypres on July 4, 1915. 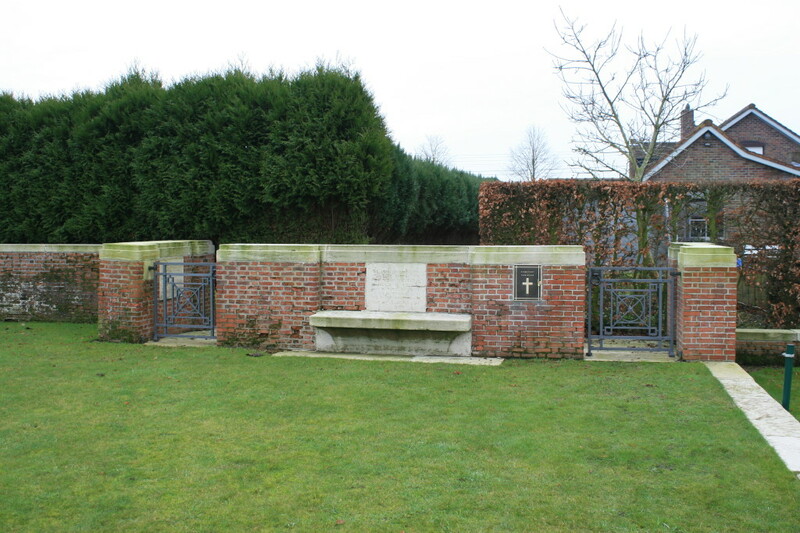 He is buried here at Potijze Wood Cemetary. If anyone can help us trace the route of the 87th particularly the first section from Coulommiers to Venizel we would be grateful. Sounds like an excellent tribute, Ray. Hopefully someone out there can help. I presume you have the relevant War Diary?